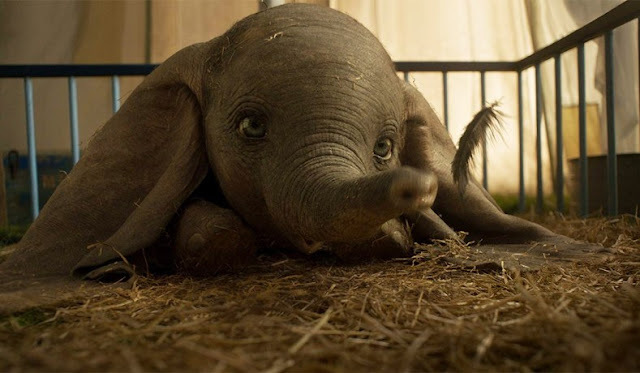 Many of the reviews for Disney's live-action/CG Dumbo goofed on how a film featuring a flying elephant failed to "soar". And, despite the movie opening in the top spot at the US box office, that can also be said for its performance. Tim Burton's latest took in $45 million, according to studio estimates. That's far from a great opening and below the Mouse House's expectations, yet with a day-and-date launch in many countries around the world, it saw its performance boosted to $116 million worldwide. Compared to the likes of Disney stablemate Captain Marvel, however, that's not a particularly impressive start. Now we'll have to see if Dumbo can hold on, but given the highly competitive marketplace for movies, that seems doubtful. Jordan Peele's Us fell to second place, but still added $33.6 million, crossing to $128.2 million in the States alone. Given that it was made for $20 million (before marketing costs), the horror pic's American performance and its current worldwide total of $174.5 million is a definite win for the director. And with four weeks in the chart already under her belt, Captain Marvel stayed powerful, bringing in $20.5 million at third and crossing the $350 million mark domestically. All (dollar) signs point to it joining the $1 billion club this coming week. Five Feet Apart made $6.2 million in fourth, ahead of the week's second new arrival, controversial faith-based anti-abortion pic Unplanned. Refused advertising by most of the main US networks, the drama landed in fifth place, earning $6.1 million. Fantasy theme park animation Wonder Park dipped to sixth place with $4.9 million, while How To Train Your Dragon: The Hidden World took in $4.2 million. Hotel Mumbai expanded its release, adding $3.1 million to its current US total of $3.2 million. Tyler Perry's latest, A Madea Family Funeral, notched up $2.7 million in ninth, with Harmony Korine's new film, The Beach Bum, launched in 10th place with $1.8 million. Which doesn't sound like a lot, but makes more sense when you compare its 1,100 screen count with Dumbo's 4,259 screen booking.